I wanted to talk to you about a lot of things hidden inside the trailer. Some things I didn´t discover before. I started off with watching the trailer a couple of times, then I take a look at the text in the beginning. To find more and more hidden secrets. Did I really see Richard Armitage in that trailer? I do think so I don't know who he will be playing, but I know it was the one who is telling us about Rollo's betray on Ragnar. Will he betray Ragnar for real I don’t know they don’t show it to us in the trailer everything is possible? Is Ragnar going to the betrayal on Kwindreth and what will go to happen if she finds out? 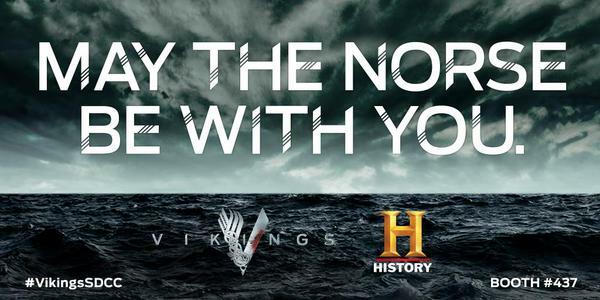 How will this develop if there is a new woman on her way to Kattegat? What will she do if she finds out about betrayal? We know what she did to her own brother and uncle. How about Ragnar and Aslaug? If Ragnar will hear from anyone what she did with the priest in Kattegat? Will there be love between them again. Lagertha and Kalf were getting close at the end of the season will it hold knowing Ragnar knows how she really feels about him. Will she betray Kalf the way he did to her? I would love to see that happen. In the trailer, we see also what seems to me the younger Athelstan as god figure but it could also be that he appears in Ragnar dreams, King Eckbert, or in Judith’s. It could also mean that Judith’s son Alfred is grown into a handsome young men. Floki locked in a cave the chains are like Jesus on the cross is it to convert Floki or to put Floki ashamed. What would be the reason behind it only time will tell. Will Floki turn into another faith? I think he will stay truth to the gods. Is Rollo going baptized again? He is going to get married. What will this mean for him? When baptized will he see it as fun like the first time or will he this time take it seriously? How will it go between him and Gisla I think it is just a matter of time. The love between Ragnar and his dead soul mate Athelstan will it survive? What does it mean for Alfred? Will the love continue between them or is Ragnar going to protect him from King Eckbert. Will Ragnar even find out there is a mini Athelstan born. What does it mean for Ragnar as Alfred appears? How deep will the love from Ragnar be to another child Magnus (Barefoot) the one he did make with Kwindreth. Is there still love between Kwindreth and Ragnar? Ragnar told Floki he loved him but because of him killing Athelstan. It leaves him no choice to judge him. At the end of the trailer, we see Helga and Floki together do that mean that we have a couple who is also a loving couple in the mythology of Loki. I will come back to that later on. Brother love is it possible in betrayal? I do think so. They love each other but will it concur another betrayal if it is a betrayal anyway. Should Ragnar not be happy for Rollo. Rollo who’s live just starts to get something in common with Ragnar’s. Could there be love between Gisla and Rollo? I wonder and think it won’t work. If you watch the trailer I would say they have a love-hate relationship just like he has with his brother.